Another homemade laundry soap recipe? I hear ya! The internet probably doesn’t need more homemade laundry soap recipes. And Pinterest certainly doesn’t. When my family began making the switch to natural products, many years ago, it was hard to find products made with safer ingredients. 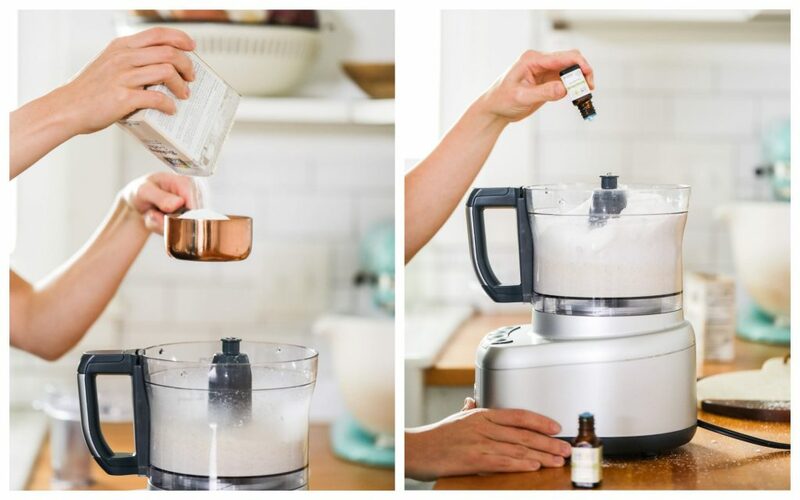 I was determined to stop using toxic products, so the homemade route was the only option for switching out a number of products. Laundry soap was one of these products. At the time, there were a number of recipes online for homemade laundry soap using Fels Naptha. I didn’t want to use this particular soap, so I subbed in a natural option, castile soap. I was so impressed with the end result that I ended up creating, and later sharing, both a liquid and powder version. The recipes have lived on Live Simply for a number of years now. Many reader friends have made the recipes and been just as pleased with the results. I’ve also received a number of requests for a “no Borax” laundry soap, since both recipes rely on Borax as an active ingredient. 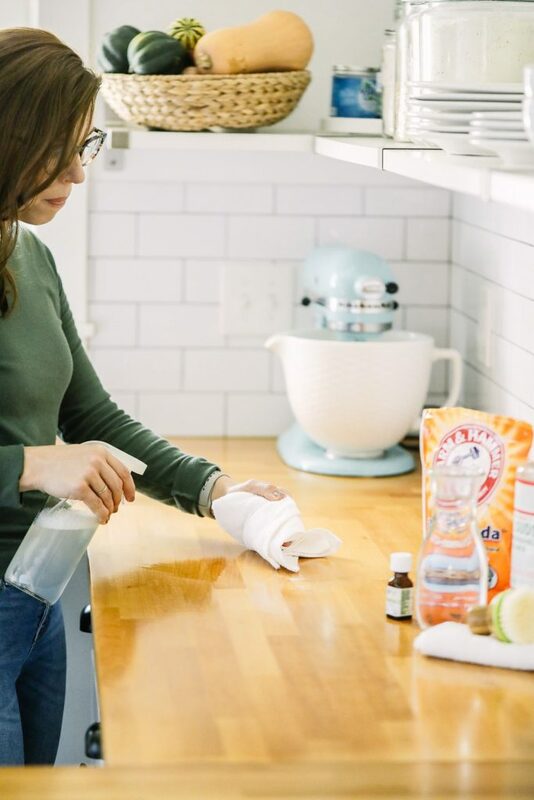 Borax is a fantastic cleaning ingredient, and one that I feel perfectly safe using in my home. Of course, just like any ingredient, if you don’t use it properly (i.e. eating Borax) you could face some potential harm. I personally take the stance that Borax, when used properly, is a great cleaning product. (Wellness Mama wrote a helpful article about her stance, too.) Others don’t share my opinion, and I’m cool with that. We all need to make our own informed decisions. 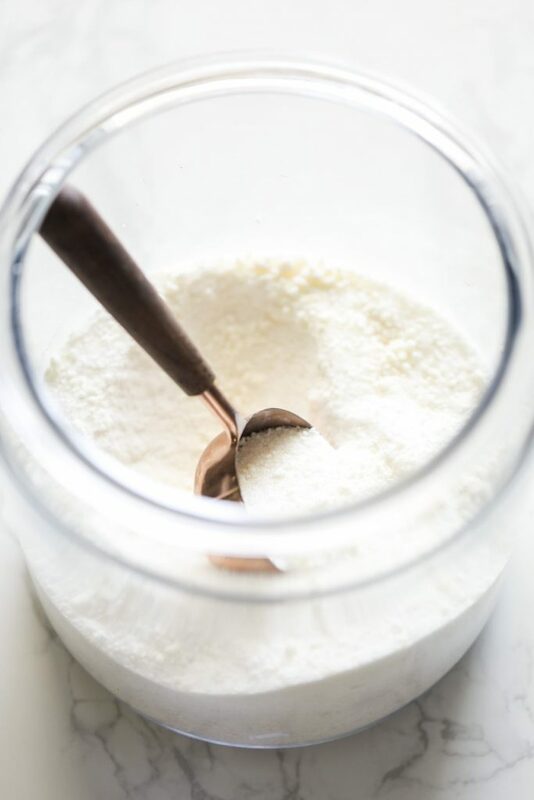 Today’s laundry soap recipe (laundry soap recipe number 3 on Live Simply, and probably the last laundry soap recipe to be shared here) is similar to my other recipes with the exception of Borax. After much testing, I believe this laundry soap powder cleans just as well as the other recipes on the blog. 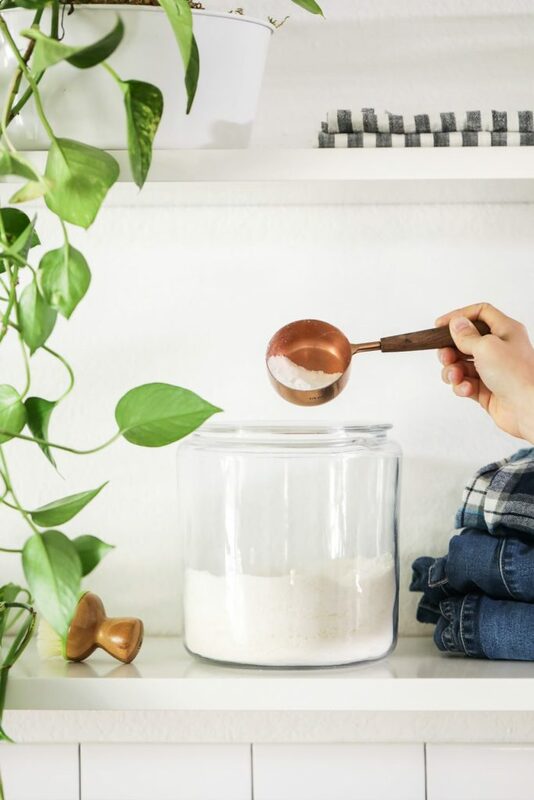 Instead of Borax, this recipe uses a combination of washing soda and baking soda to freshen and clean clothes. Castile soap lifts dirt and fresh stains, washing soda increases the cleaning power of the soap and helps to lift dirt and stains as well as eliminate odors, baking soda softens garments and eliminates odors, and salt cleans and naturally softens garments. 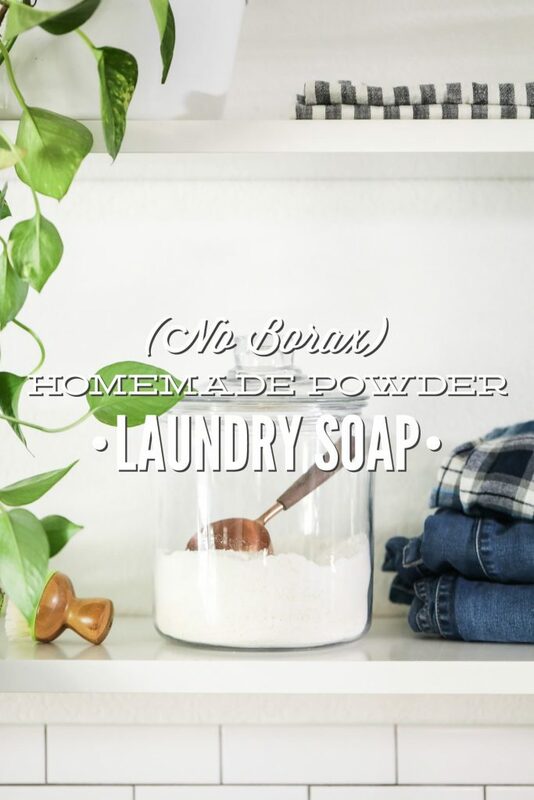 The laundry soap works just as good as more natural store-bought options. 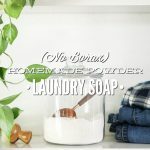 And speaking of store-bought laundry soap, there are quite a few safe, more natural options on the market today. So if you want to purchase laundry soap instead of going the DIY route, awesome! A natural lifestyle isn’t about “doing it all” or “making it all.” Living a more natural lifestyle is just as much about simplifying as it is about getting rid of toxic products. It’s important to be intentional about what you want or need to make, what you can live without (I don’t think anyone is going to live without laundry soap), and what you can purchase from the store or a market. Personally, I choose to purchase laundry soap from the store 99% of the time. This isn’t because I don’t like homemade laundry soap, or because it’s not effective. I would rather spend my time making something else, or spending time with my family. I’m thankful for the increase in more natural store-bought options. 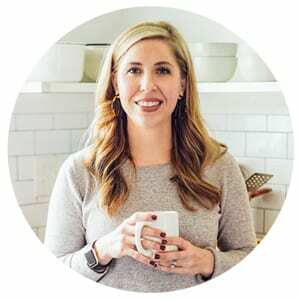 I’m going to share more about my favorite store-bought options in a couple of months (part of the Switching to Natural Products Series). For now, here’s a few of the products that make my current favorite list: Optimist Co., BioKleen, Better Life, Seventh Generation Free & Clear. Homemade laundry soap made with natural ingredients. 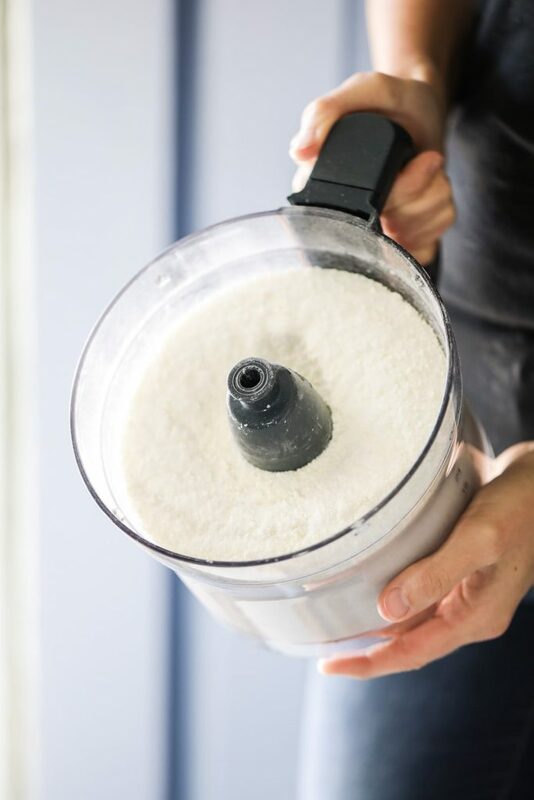 This easy-to-make laundry soap can be used just like a powder store-bought soap. Cut the bar into small, thin slices. 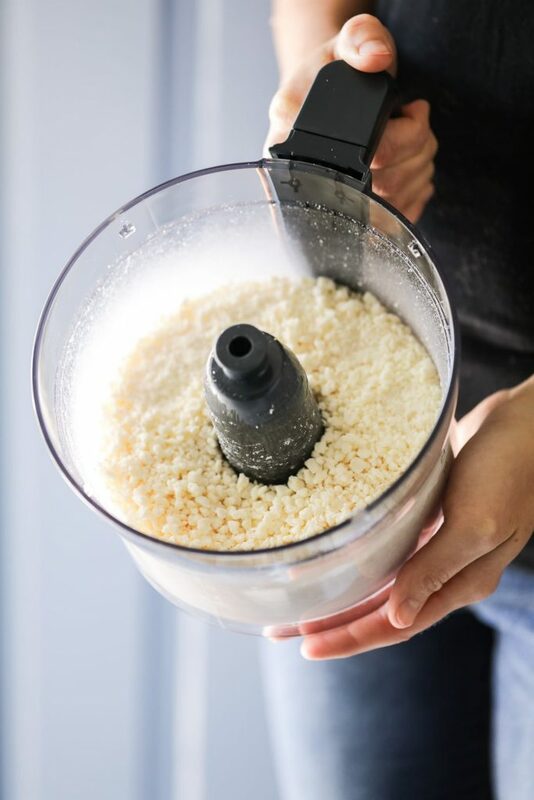 Place the soap chunks in a food processor bowl. Pulse until the soap resembles small crumbles (almost like finely crumbled feta cheese). 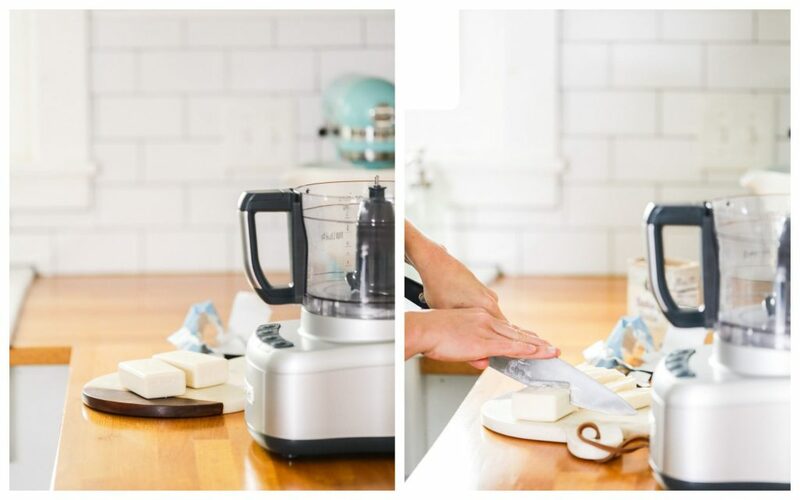 Alternatively, shred the soap with a sharp cheese grater into a large bowl. 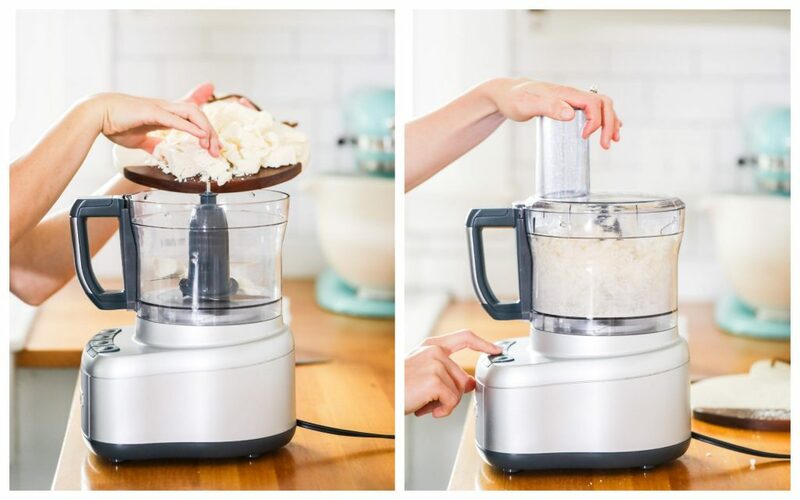 Add the remaining ingredients to the food processor, and place a dish towel over the processor bowl (optional, if you find the powder is circulating in the air). Pulse until the ingredients are well combined and the mixture resembles a fine powder. Add the essential oil, if using. Place the dish towel over the bowl again. And pulse for just a few seconds to combine. Pour the soap into a storage container with a lid. The soap will keep for at least 6 months. Stir or shake the soap before use. Scoop 1-2 tablespoons (for HE machines) or ¼ cup for top-loaders, and add directly to the clothes in the washer (not the soap dispenser). Use the warmest water possible for your clothing. See the troubleshooting tips below for more help. Would it be possible to boil this recipe and make it into a liquid? When I put it in my washer tray where powder goes, its clumps up and does not go down. Hey Kelli, I’m not sure. I recommend putting any powder in the actual wash versus the tray dispenser. Wow. I’m going to try this! Looks great. is this laundry detergent good and safe to use with dark cloths? Is there any white residue on the garment after washing? Hey KHOLOOD, I recommend two things: wash the clothes inside out and using warm/hot water. This should prevent any white residue. Also, avoid speed cycles.